All attempts, natural and unnatural, to put myself to sleep in time for my 7 o’clock bus to Pokhara, have failed. I lay awake watching endless hours of laughable television programming, enjoying the commercials, dubbed in Nepali, way more than the shows, until I fell into a state of limbo in the early hours of the morning, which was abruptly interrupted by loud knocking at the door at 6, accompanied by the ringing of the phone, which I found, did not go away as I lay in a semi-yogic state, chanting to myself, “annicha, annicha”. I blearily opened my eyes and the door, to come face to earnest face with the hotel receptionist, who urgently informed me that it was time for the bus. I hurriedly packed my rucksack, stuffed my guitar in its case, and set off to the bus stand, with the hotel guy, who doubled as a cab driver. The bus was a tourist friendly one, with recliner seats and double-glazed windows. Settling myself down in a warm cocoon, along with tens of other similarly dazed foreigners of various nationalities, we were all transported to the West of the country. I managed to catch up on my sleep, which was uninterrupted, except for a breakfast halt along the way, a beautiful spot, where the river valley met the mountains. 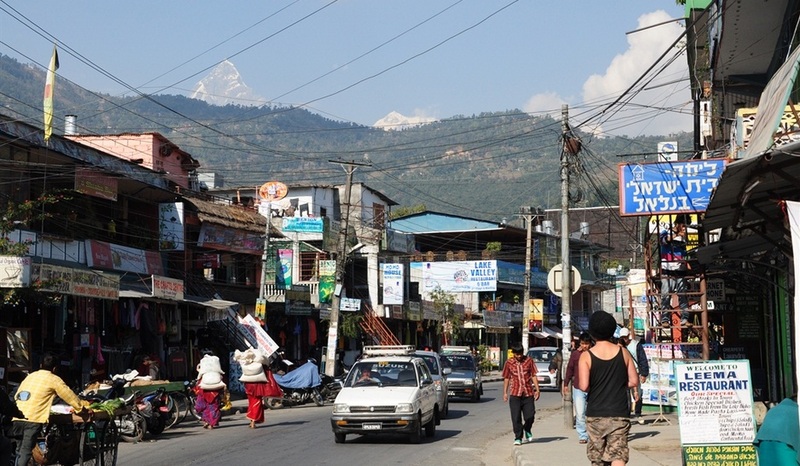 Pokhara arrived in the afternoon, foggy and bleak yet serene and, rejecting offers of cheap hotel rooms and cheaper hashish, I slung my guitar and sack across my shoulders and wandered through the sleepy, quaint small town of Pokhara. I stopped along the way to buy a birthday present for my dad at the bookstore, ‘Into Thin Air’, by Jon Krakauer. I also picked up a little wallet with the eternal knot on it, made from hemp, at one of the specialty stores lining the main promenade down to Phewa Lake, which stocked, among other things, hemp clothes, seeds, dream catchers, bags, tapestries and even guitar cases, which were, as I found to my dismay, quite over-priced, even as the store owner, a beefy man with long hair, took note of my own guitar and smiled at me in a way that only guitarists and trippers, universally understand. I had finally reached the unofficial destination of my travels! As I descended down the Basundhara Park path to Pokhara’s famous icon, Phewa Tal, I breathed in a gust of the fresh, misty air by the lakeside, sitting down to enjoy the tranquil sight of leaves floating on the surprisingly massive lake’s surface, overtaken sometimes by long canoes with places for tourists, slowly and silently gliding upon the smooth water. I spent a good hour there, by the lakeside, in quiet contemplation after a solid smoke, until I figured, it was now time for me to be returning home. I retraced my steps to the main street, and boarded the first local bus I saw, that I figured, would take me to the local bus park, where I might find a bus to take me to Kakarvita, the Nepali border town near my parents’ home in Siliguri. The bus filled up swiftly, picking up tons of denizens on their ways around the tiny Himalayan town. I was treated to a veritable tour of Pokhara and its people, especially when a bevy of local college girls boarded and stood in the aisle of the narrow bus, looking quite pretty and quite lost, until I, my guitar and my rucksack gave up our places on the back seats of the bus, and they all sat down with much relief and many, happy, suggestive smiles in my direction. I smiled back, savouring this. I got off at the local bus park to find that Kakarvita buses left from a different plaza altogether. This was when I started to freak out a little. Much as I wanted to remain a good many more days in this lovely Himalayan paradise, my Nepali Money was running low, and I had to get back to Bangalore for Christmas, after a few days with my parents. I commandeered a taxi to take me in haste to the mentioned bus stand at Prithvi Chowk, where upon reaching, I found that there were no direct buses to Kakarvita. I must have looked about ready to break down right there, for a helpful young bus conductor told me he was going to Kakarvita himself, and would accompany me and guide me through the changes of transportation it would take us to reach there. I readily boarded the bus, huddled into a fetal position on my bus seat, gazing at passing fields of heavenly snow, in the bitter cold of the Himalayan winter, and watched the scenery slowly fade away into darkness, as the hills gave way to the valley, and the sun to the moon.